In 1865, Baron Haussmann – was commissioned by Napoléon III to "modernize" Parisian urbanism – and decided to group the abattoirs and the livestock market in Paris at la Villette. The site was inaugurated on October, 21st 1867, with its three immense halls for the livestock market – built by Jules de Mérindol – to the south of canal de l’Ourcq, and the slaughterhouses to the north. The history of this neighborhood was often confused with that of this closed world, fascinated by its rites, codes and hierarchies… disturbing too, especially in the “city of blood” where – towards 1900 – 23,000 sheep and 5,000 oxen were slaughtered and butchered every day. From the beginning of the 20th century, slaughterhouses were struggling to cope with the soaring meat market. Equipment was modernized in 1930, but problems arose once again in 1950, accompanied by an alarming fact: with the rapid expansion of the refrigerator industry, it was more profitable to slaughter the animals on livestock breeding premises. However, the reconstruction of the abattoirs which were obsolete and run down was decided in 1959, to create a national “wholesale meat trading market”. Technical difficulties and financial costs delayed construction. The "scandal of La Villette" soon made the headlines. Construction work was stopped in 1970 and the industrial abattoir closed in March 1974. In 1979, the site was redeveloped as a unique complex that associates – over 55 hectares – nature and architecture, leisure and culture. 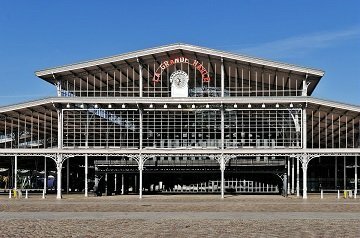 The main witness of these former slaughterhouses is the “Grande Halle de La Villette”, which has today become a cultural and events venue. Related: Halle aux Cuirs. Find more information about industrial heritage in the Seine-Saint-Denis department.